There are currently 117,719 users on this website. Picked this up for $98. 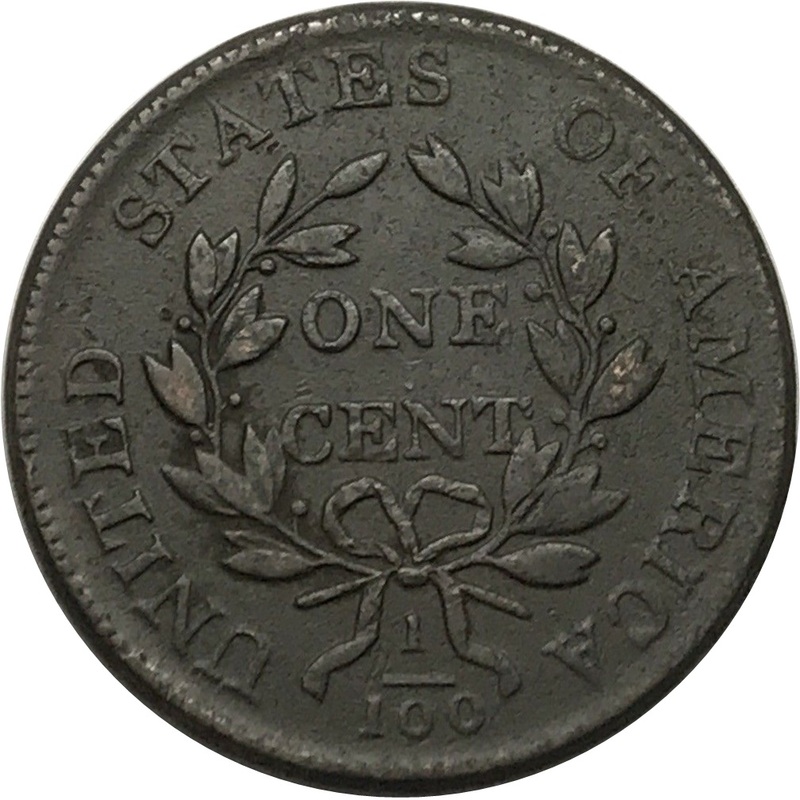 Coin has obvious corrosion but I like the look of the coin . Wreath with stems and short fraction bar. This looks like the Small Date, Large fraction but can't nail down the Sheldon variety. Thoughts on grade, variety and problems? Thanks! I also think this is the small date, but it is the large fraction. In the small fraction, the last zero in the 100 denominator of the fraction lies inside the turn where the ribbon flares out to the right. To me it seems clear that the last zero in the denominator lies outside of the turn where the ribbon flares out to the right. To illustrate, in the small fraction, the last zero should be mostly to thw left of the red line and not under the horizontal part of the ribbon. Getting a little frustrated and worried. I cannot attribute thus coin. The fraction does not match thw large fraction varieties because the top serifs of the 1s in the fraction aren't long and do not extend far to the left. 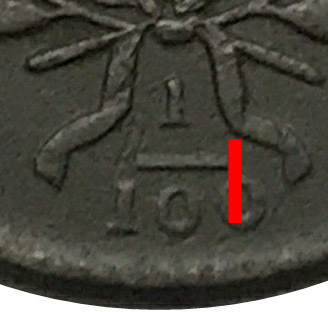 The fractions look a lot like that of the S-244 but the 3 in the date does not touch the bust. Arghhh... Help! Hopefully it's not a fake. VF details. I think it's a small date, small fraction, and I agree with S-250. Bingo! It seems that this coin does match S-250 comparing to known examples. I was thrown off becauae it didn't match other small fraction varieties that I had seen. My apologies to panzaldi who actually was right in calling it small date small fraction. Thanks to him and Phil310 for your help in attributing. Ron Guth: Sheldon 250 is one of the 1803 Small Date, Small Fraction varieties. 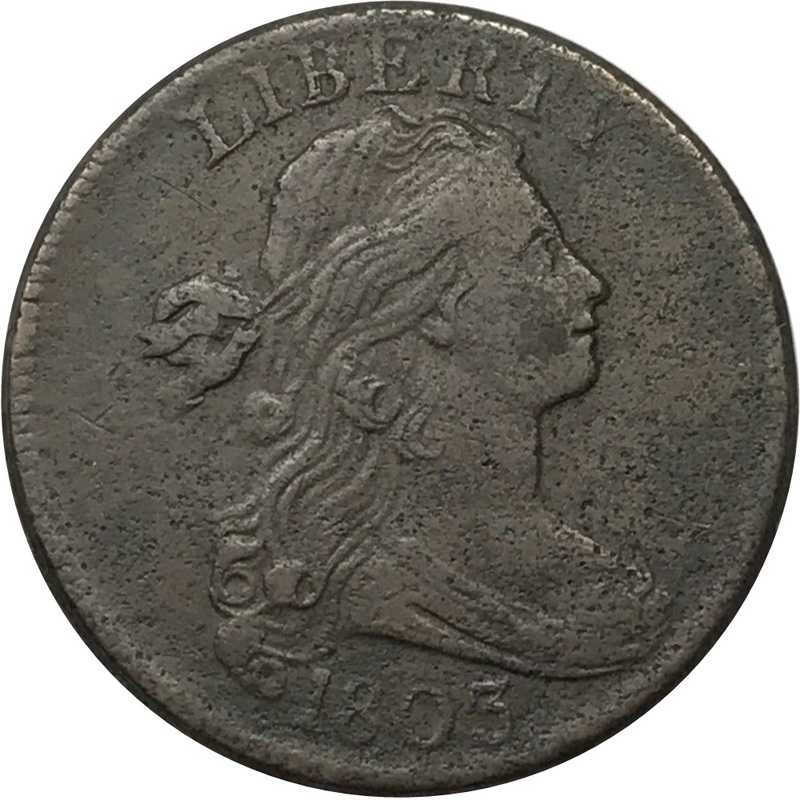 Both Breen and Noyes call it Rarity 3, which makes it somewhat scarce as a die variety. Sheldon had it as a high R4.